Another senior officer was killed today as the Libyan National Army lost nine dead in bitter fighting in Benghazi’s Ganfouda district. Mohamed Al-Busaifi of the Zawia Martyrs’ battalion was killed as the army sought to drive a wedge through terrorist positions, cutting off a coastal strip from the rest of the enclave. He is the third senior officer to die in the last week. Seven of the other soldiers to perish were in the 106 Battalion. The army has given no figure for the number of wounded in today’s battle. However, around midday the Benghazi Medical Centre put out an appeal for extra staff to come to the accident and emergency department. The terrorists launched two suicide vehicles towards army lines but both were destroyed by heavy gunfire before they could reach their targets. 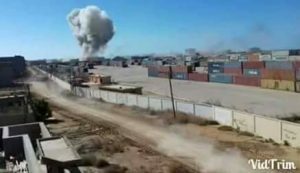 The detonation of one of the vehicles near the customs compound from which the militants were driven last week sent a huge plume of smoke into the sky. The army also claimed to have captured three technicals as well as an ambulance. Once again there are no details of dead or wounded among the fighters of the Benghazi Revolutionaries’ Shoura Council and their IS and Ansar Al-Sharia terrorist allies. Nor has the army released any details of civilians seeking to flee the enclave. The recent suicide bombing by at least one apparently-surrendering female in Sirte is likely to have reinforced the LNA’s demands that anyone wishing to leave the encircled area will have to be searched.